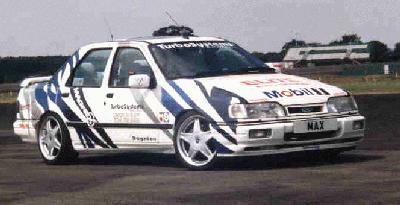 1988 Sierra Sapphire Cosworth reshelled with a 1991 4x4 body. Duh! Where have you been? Sony pull-out radio/cassette/12-disc CD player. and a mono base tube. crank and a high pressure water system w/swirl-pot. & big wing sump and Scorpian stainless steel exhaust system, 3" pipes to 4" tailpipe. 500 lb front & 350 lb rear springs and front strut brace. Tar-ox 40 grove brake discs w/ titanium calipers & carbon fiber pads. Donlop 215/40/17 fronts and 245/35/17 rears. and a low boost switch and an on/off ABS switch. All on a carbon fiber panel. 180 + / 0 to 60 = sub 4 sec. / 0 to 100 = 8/9 sec. keeps us separated so I don't get my doors blowed off as he goes by me.